My next book now has a release date – and its cover was revealed in an exploration of the Ordshaw style over at Bibliosanctum yesterday. If you didn’t see it coming, that’s fine – The City Screams, officially a full-length novel, even if I keep calling it a novella, came as something of a surprise to me. Bringing together three separate ideas festering at the back of my mind, I was inspired to write a short story, a light palate-cleanser between Blue Angel and Ordshaw Book 3. It took on a life of its own, though, demanding more. More. More. Today, that supposed-short story might earn the official title of Book 4, even if it’s set to come out before Book 3, and it’ll be available in print. So what on earth is going on? What’s The City Screams All About? Tokyo for experimental ear surgery, she starts to hear things that she shouldn’t. It features a new protagonist, Tova Nokes, a council admin out of Ordshaw, deaf from the age of seven. She’s won a lottery for a miracle hearing operation – one too good to be true. She’s left behind loving friends and family, but she won’t be totally alone in Japan. There’s Ki to keep her company. Only she doesn’t know him, or that he’s watching her, and his presence makes things very complicated. The City Screams is peripherally connected to the main Ordshaw series, with the same thrills and wild twists, but a stand-alone story. Here, the threats are less visible, and the mystery far less easily explained. Enter Tova. Her origins lie in the time I spent working researching disabilities for a support app. I was fascinated by the idea of deaf communities, living parallel lives, experiencing the world in a totally different way to me. I wanted to explore that more, and when this idea of a deaf protagonist crept into my mind, it was the perfect way to draw together the twin threads of the Blue Angel reference and that sci-fi story. It was also a recipe for turning a fortnight’s hapless short story writing into a full novel. Tova’s hearing difficulties didn’t just make the story more complex – it gave me work to do in terms of the nature of her character, what sort of person she was and why. It also led me to trying to get feedback from the Deaf community on what I had created. Which proved more difficult than I anticipated, but I’m thankful for the roads it took me down. I hope you’ll enjoy this next instalment in the Ordshaw universe – even if I say so myself, I think Tova’s been a delight to spend time with, and the story’s one that really swept me away. 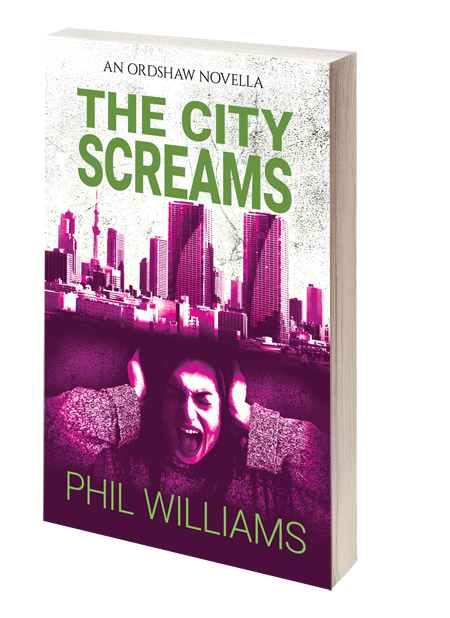 The City Screams is out on April 9th, in eBook and paperback format, available for pre-order here.